Benny Gantz and Moshe Ya’alon expected to announce next week that their two parties will run for Knesset together as one list. 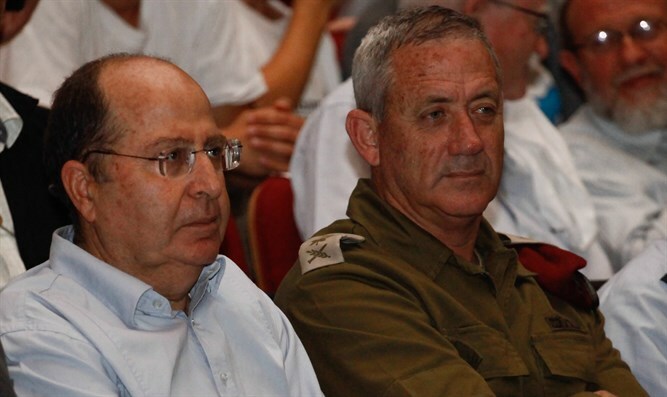 Benny Gantz and Moshe Ya’alon are expected to announce next week that their two parties will run for the Knesset together as one list, Kan 11 News reported on Friday evening. According to the report, the two are hoping to join forces with other political figures in the future. It was also reported that Ya’alon, who intends to replace Prime Minister Binyamin Netanyahu, has no intention of being part of a coalition headed by Netanyahu. Gantz officially registered his new party on Thursday, and it will be called Hosen Leyisrael (Israel Resilience Party). Ya’alon is expected to officially unveil his new party and announce his partnership with Gantz next week, according to Kan 11 News. Earlier this week he published a video in which he announced that he would set up a new political party to run in the upcoming Knesset elections in April. Meanwhile on Friday, Channel 10 News reported that former cabinet secretary Zvi Hauser is in advanced talks with Ya'alon and is expected to join his new party. Hauser rejected the report and said his joining politics is “not on the agenda right now." On Thursday, Channel 10 News reported that opposition leader MK Tzipi Livni is interested in joining forces with Gantz and Ya'alon, but they are wary of having her join due to her identification with the political left. Netanyahu, who was asked on Thursday night about Gantz, hinted that the former Chief of Staff is from the left side of the political map. "It is none of my business how the left divides its votes," Netanyahu told reporters before leaving for Brazil, upon being asked about Gantz joining politics.